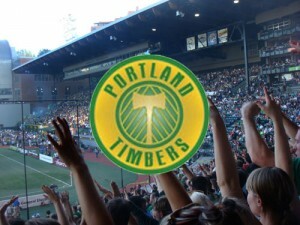 After an eleven year absence the Portland Timbers soccer team was reborn in 2001. The team played in the A-League, the second division of American soccer at the time. The announcement that Portland had acquired an expansion team had occurred on July 31, 1999. Nearly two years later, on May 11, 2001, the team took to the field to face the Seattle Sounders in Portland’s home opener. Before 12,295 fans in the newly renovated PGE Park, the Timbers won the match 2-0, getting goals, both assisted by Darren Sawatzky, from Mark Baena and Brent Sancho. The Timbers Army (then known as the Cascade Rangers) sang for the home team for the first time, and Timber Jim reappeared as well that night, after a nearly 20 year absence, to cut slabs and rile up the crowd.